Oil prices are generally seeking higher ground, responding to yesterday’s EIA inventory report. Crude prices are up $.50 today to $52.64, after trading flat yesterday. 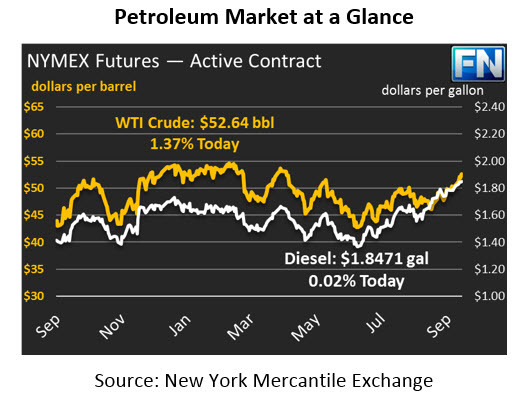 Just last week, crude prices peaked above $50 for the first time in months; in the past, prices hitting $50 has triggered selling and traders bidding the market down again. This time prices have held their ground, signaling the bullish sentiment in the market. Gasoline is a bit lower this morning, down roughly a penny from yesterday’s close to $1.6442. Gasoline gave up almost four cents yesterday in response to the EIA’s inventory report, bringing it back down from highs earlier this week. Prices are up from this morning, when prices opened in the $1.63 range. The EIA released their inventory report yesterday, and markets are finally beginning to respond to the EIA’s report, with stock movements more or less inversely correlated with price. Crude stocks fell 1.8 million barrels (MMbbls), a larger draw than the API predicted and a complete reversal from the market’s expected stock build. Crude stocks have built 15 MMbbls over the past month following Harvey, so the draw is seen as a strong sign of market normalization. Gasoline also proved to be a surprise player, with a 1.1 MMbbl build, compared to an expected stock draw. On the international front, tensions are escalating in Iraq. After a 93% vote by Kurds in favor of independence, Iraq is moving troops into Kirkuk, one of the contested areas, to take control of oil fields in the area. Turkey continues to support Baghdad, hoping that a decisive response to the referendum will help prevent the movement from spreading to Turkish Kurds. Turkey PM Erdogan has warned that the nation may close off the pipeline that connects the Iraqi Kurd’s oil fields to outside markets. Markets are closely watching to see if the situations devolves into conflict and instability, particularly focusing on how the situation will affect oil production.